Independent natural and organic neighborhood grocery store. High-quality foods that are fairly priced. Quick meal solutions that are tasty. Our focus is always on quality and great taste. Convenience and more for 20 years - your neighborhood corner grocery. Great new quick biscuit recipe! Amaze yourself with this one. Watch for local, seasonal fruit and produce plus new food products. Sign up for notices of new arrivals and specials. Gift Cards - Gift cards can now be purchased at either of our stores: Sunset Hill and Ballard Public. The cards can be loaded with any denomination and do not expire. Introduce someone to our shopping experience by coming by and picking up a gift card for a friends or member of your family! 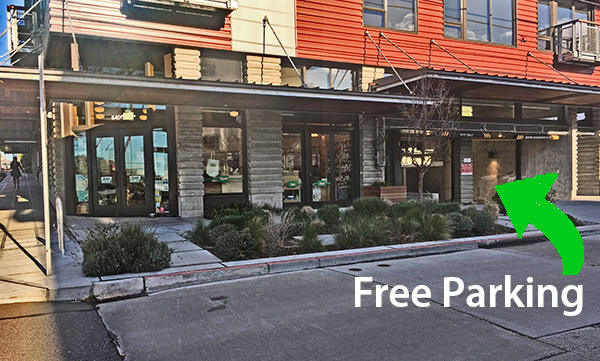 Parking - Having trouble parking at Ballard Public on 24th? The garage on the 64th side of the building is available. The first 11 spots as you enter are reserved for customer parking. You are welcome to park here if you are visiting any of the stores, restaurants, or shops in the building.